ST. IGNATIUS was born at Loyola in Spain, in the year 1491. He served his king as a courtier and a soldier till his thirtieth year. At that age, being laid low by a wound, he received the call of divine grace to leave the world. He embraced poverty and humiliation, that he might become more like to Christ, and won others to join him in the service of God. Prompted by their love for Jesus Christ, Ignatius and his companions made a vow to go to the Holy Land, but war broke out, and prevented the execution of their project. Then they turned to the Vicar of Jesus Christ, and placed themselves under his obedience. This was the beginning of the Society of Jesus. Our Lord promised St. Ignatius that the precious heritage of His Passion should never fail his Society, a heritage of contradictions and persecutions. 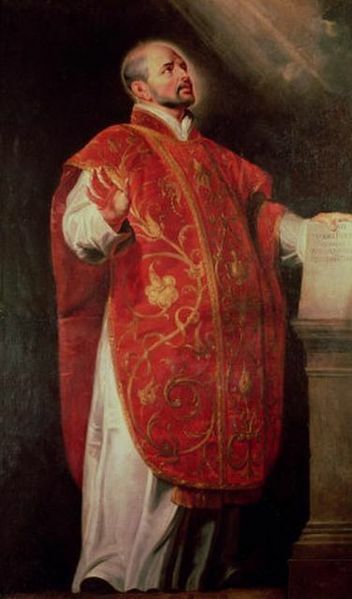 St. Ignatius was cast into prison at Salamanca, on a suspicion of heresy. To a friend who expressed sympathy with him on account of his imprisonment, he replied, “It is a sign that you have but little love of Christ in your heart, or you would not deem it so hard a fate to be in chains for His sake. I declare to you that all Salamanca does not contain as many fetters, manacles, and chains as I long to wear for the love of Jesus Christ.” St. Ignatius went to his crown on the 31st July, 1556.